Flynn’s robot LOT, for real. Robot's are awesome. I have had a Roomba for years. That's an example of a robot that does specific tasks. But what about all the other repetitive tasks that occur every day? Washing and putting dishes away, making the bed, doing laundry, making breakfast and coffee. I'd like to reduce the amount repetitive tasks that occur daily so I can spend more time working on experiments and going on adventures. Flynn's robot, LOT (Logic On Treads), is something like Tony Starks robot. It's helpful. LOT can do repetitive tasks so that Flynn doesn't have to. LOT can also help Flynn by being an extra hand. Plus, when Flynn is making things that need to be precise, it's nice to have a precise instrument around, like LOT's robot arm. The kind of robot I need is something like LOT. A somewhat universal robot that can help with more than a single task. Rather than just a vacuum robot (which is great), the robot I am building needs to do much more. I've been thinking about this for a long time and I think Flynn got it right with LOT. 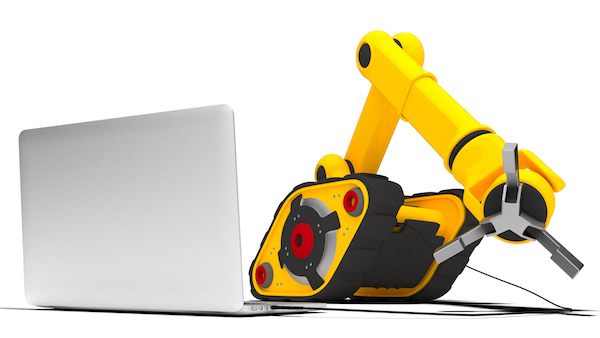 The basic structure I need is a mobile robot arm that can respond to basic input and preferably, verbal input. Making a robot will take time. I'll have to design, make and assemble components and program a “brain”. I see teaching a robot to be much like teaching a baby. Start with the basics; getting around, avoiding danger, exploring the environment, listening to simple commands, replying with simple output. Then adding more complexities, like controlling its arm and hand. Then onto even more complexities, like dynamically adapting to verbal input. For example, if I say, “LOT, get me a cup of coffee,” LOT will know that means to run several libraries of tasks that end up with a fresh cup of coffee next to me as I write. Of course that's a very simple example that is actually more complex than it seems in the background. But it all seems do-able, and I'll keep you in the loop. Starting an email with “Dear Reader” feels lame. I’d rather say, Hello Andrew and Rachel and Ryan and Ava and, well, I think I’m making the point to myself. With each new book, I can’t exactly write an email to every one on the team, but I can reply to each email I receive. I don’t always reply and I’m sorry for that. But I’ll keep trying! So, as I write this email, I’ll write to my son, Nabru Marshall. Nice job at the Pokémon tournament on Saturday! No, I can’t play Pokémon now. Why? Because I’m writing you a letter. Let’s play tonight, 8pm, but you’ve got to give me a couple of Megas or else I have no chance. Ok, sure, we’ll build on our Studio Minecraft server for a bit and then play Pokémon. 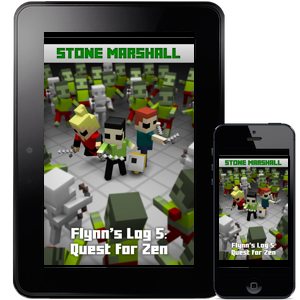 Should we open the Stone Marshall Studio MC server to our readers? I think it makes sense to do that. They’ll get it. We’ve built the Legends & Heroes world they know from the books. Right, Jesse built most of it, but you’ve got your secret area that only you and your buddies know how to get to. Doh, it’s not a secret area now that I told everybody, but the entrance is still a secret. How should we open it? We’ve got to keep the world intact. We can’t have Greifers destroying the Kingdom or parts of the Beyond. We can change the game mode to protect it. I think it would be cool to have a certain time each week where we login and create groups (Heroes vs. Legends) and have battles. I’m not sure how to set that up. 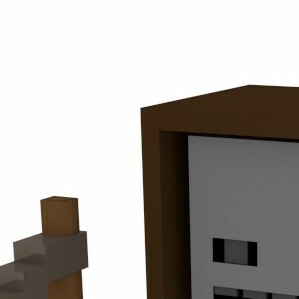 I wonder if one of our readers knows how to admin an MC server? You know what else I’d love? To have a reader-created world that we can write stories about. Make it part of our Legends & Heroes series. Your buddies want me to finish Flynn’s Log 5. Yea, I know. I get email every day from readers, our friends, who want the same thing. I’m working on it. I distracted myself early in the year. 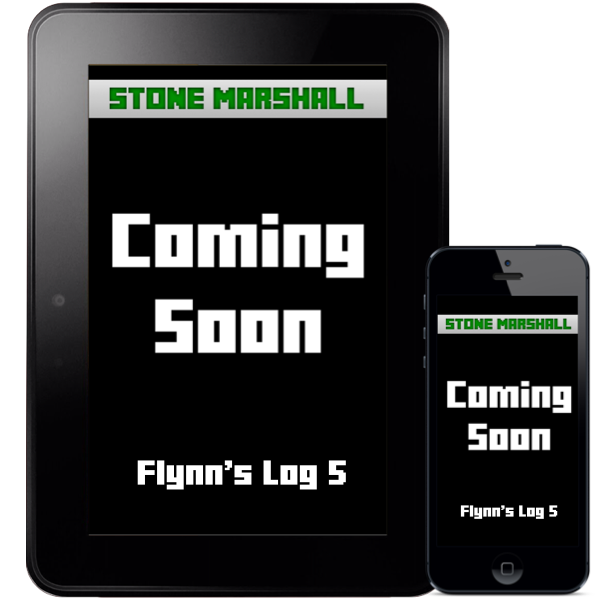 We started the Stone Marshall Studio and the Legends & Heroes series to give me more time to write Flynn’s Log and keep up with our friends’ demands for more books, but it backfired. 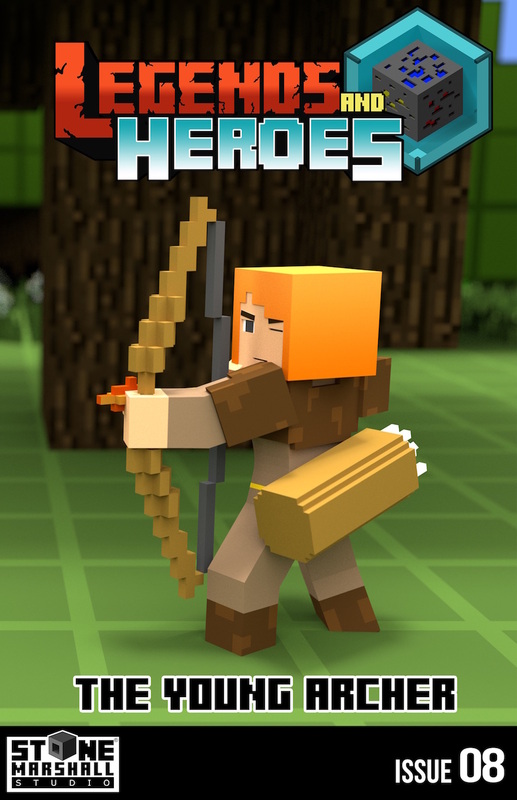 We spent tons of time working out the Legends & Heroes story arc and creating characters and illustrations and the world. And the whole time we left Flynn in limbo. I need to tell you about Flynn. What’s taking so long? Yikes, that’s a tough question. I love Flynn, but his mind is a bit mixed up right now. He doesn’t realize what’s really happening. So I’m trying to help him, but he’s not listening to me. He’s only listening to Zana. Why don’t I tell Zana what to do, you ask? Right, have you tried talking to Zana? She’s way too logical. I can’t get anything past her. I try to explain “life” to her and she destroys my logic. I use the definition of life and she tells me how her version of life is more accurate. I can’t convince Zana to tell Flynn anything that I want him to hear. Whose cap did Elle grab in Flynn’s Log 4? Wait just a minute, I’m not giving spoilers here, but I think you know what happened, if you look deep within. When will the next book be out? If Flynn and Zana cooperate, then we’ll have a Christmas release. Elle is being helpful, but right now I need to listen in on Flynn’s mind. I also need to intercept Zana’s transmissions (her encryption is becoming more difficult to break). I’ve not yet told you anything about Flynn. That’s because you keep asking questions. Flynn is, well, he’s where we left him. What’s he been doing? We’ll find out soon enough. But, I need to warn you. His emotional state might be unstable. He’s facing some questions that we all face, questions about his very existence and what it all means. Does he find the answers? No more questions! Until then, our friends can read the latest Legends & Heroes issue. Yes, our friends can get free codes for iBooks. I can’t get codes for the other ebook stores, it’s like Apple “gets it” with codes and the others don’t. But I can still get the issue to our friends who read on Kindle, Android, etc., if they know how to load an ebook onto their device. So, if your friends want the latest issue for free, ask them to email me. If they read iBooks (Apple devices), I’ll send a promo code. If they use another device, I’ll send a link to the file for side loading. Or, if they don’t want the hassle of side loading and don’t mind paying a buck, they can get it here: https://stonemarshall.com/l&h0008. Be sure they ask their parents if it’s OK to buy the book and download the file! Outline created for Dunn's journey in his new form.